Have you ever watched a James Bond movie and imagined yourself living like 007? On the Turks and Caicos Island of Providenciales there is a secluded development called Turtle Tail. In this private enclave overlooking the Caribbean Sea, you’ll find a villa with a bedroom that is straight out of a Bond movie. The villa has a name that grabs you right away. 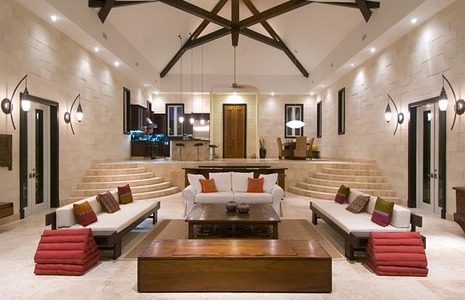 Just saying “Villa Balinese” has an ultra-cool feel to it. Step inside the Villa Balinese’s glass-walled master bedroom and you’ll experience a view for the ages. If you’re not easily impressed, then consider that this 4,200 square foot villa has a cascading waterfall flanked by a row of coconut palms when you first enter this Bond-like getaway. Inside the great room you’ll find travertine marble flooring, 30” vaulted ceilings, and walls of patterned Asian pearl-stone tiles. 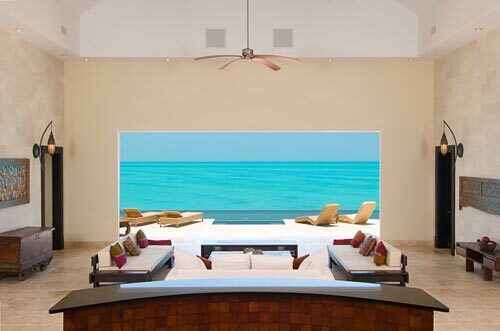 Stunning ocean views fill the entire great room. If you can’t resist the view, pull back the pocket sliders on to the large pool terrace overlooking the Caribbean Sea. Pour yourself a cold one from the concealed granite bar with icemaker, fridge, and hydrolically raised 50” plasma TV and music center. So who needs to sleep like a baby when you can sleep like James Bond? 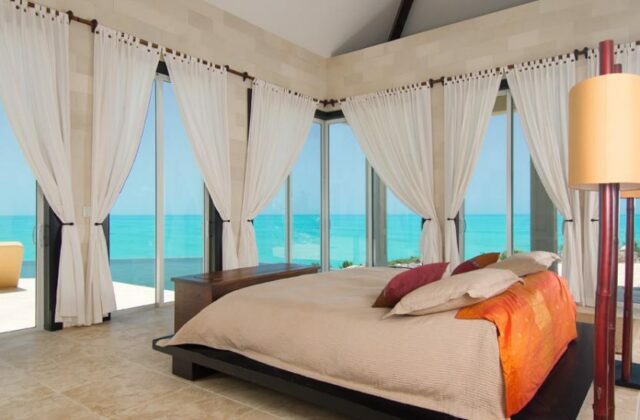 It’s okay to dream a little, imagine yourself waking up at the Villa Balinese in the Turks and Caicos Islands.